Precision tailoring and performance fabric amount to a three-button men's lab coat designed for those with impeccable taste. The H.W. Cushing slim fit lab coat is 2 inches shorter than its cousin, the E. Wilson. A notched lapel and beautiful top stitching throughout. 2 welt pockets can fit iPads; 1 chest welt pocket. The welt pocket construction is a nod to old world craftsmanship. 2 inches shorter, .5 inches longer sleeves, and slightly more tailored in the chest area by 1.5 inches vs. the E. Wilson lab coat. Hello, I’m Samuel. A third year medical student. The first time I set eyes on the Medelita lab jackets, my mind was blown away. I made a purchase almost a year ago. Two months ago I made two more purchases and look forward to making more. I am always satisfied with my purchases. And when I do call customer service for information to make a purchase, I get off the phone satisfactory. Medelita, your products bring out my best performance and I look forward to trying out your future products. The look and quality of the white coat is great! Excellent! Wonderfully fit, almost seems tailored. For the most professional look, can’t go wrong with this coat. The scrub jacket is super comfortable and comes with these great pens (included) and pen holder slots in the sleeve. Great design. I would only say I don’t love how the collar wears around my neck. These are the best styled and highest quality lab coats I have ever owned. I have purchase several styles for myself and my husband who is also a physician. I actually look forward to putting my lab coat on when I get to my office. I was always frustrated to put on a boring lab coat over an outfit that I had carefully selected. No more! My Medelita lab coats is every bit as stylish and well-taylored as my wardrobe. Well done!!!!! Love the Cushing slim fit coat! Lots of compliments already! 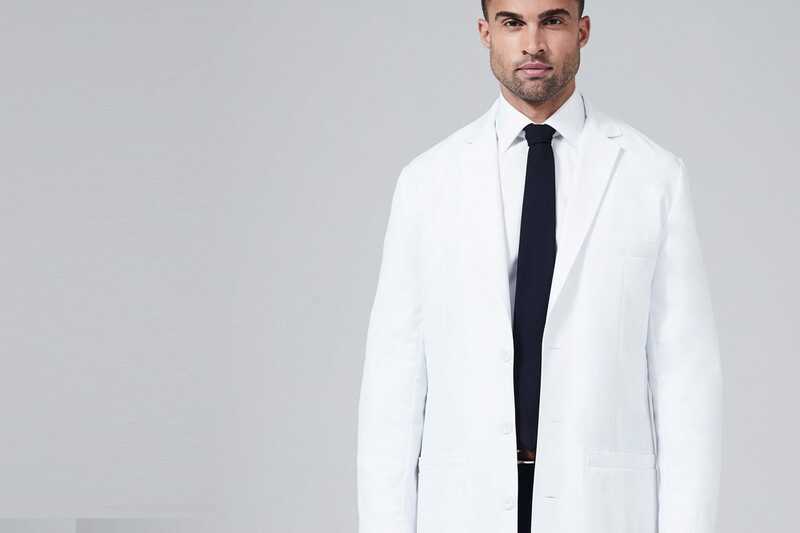 I have tried many types of lab coats but only the ones from Medelita provide the proper fit and style that would give you that unique professional look. Try it once and you wii be hooked for life. I get so many compliments on my lab coat! Our doctors are all thrilled with the lab coats. We have 9 doctors on staff and have almost all switched over to these lab coats. Always look fresh and neat. Top quality coat! Definitely stands out from the rest. A bit on the heavy side but not necessarily a bad thing. Only flaw is no side slits for easy pocket access. Q: Can I also order multiple sizes and get free return from Canada? Thank you for taking the time to write us a question. We unfortunately do not offer free returns and exchanges to Canada. Our international return policy can be found in the International Guide tab under "Medelita" on the front website page. One of our customer service reps will reach out to you to see if we can better help you find your correct size based on your measurements. Q: What size is the one that the model is wearing in the photo? A: Hi Jin, thank you for taking the time to write us a question. The model is wear a size 40 in the H. W. Cushing. He had some minor alterations to have the coat fitted to his size. Q: Does it require dry cleaning. Can it be machine washed. Can it be starched. Do you offer embroidering. Our Lab Coats do not require dry cleaning. We recommend machine wash warm, regular cycle. Whites only. Do not use chlorine bleach. Non-chlorine bleach is ok. Do not use liquid fabric softener - it will block the moisture wicking fabric feature. Tumble dry medium. Do not use a dryer sheet - it will block the moisture wicking fabric feature. Pull out of the dryer early and fold, or place on a hanger to ensure a smooth, wrinkle-free appearance. We do offer embroidery services. Allow us the opportunity to display your name and title - embroidered with prestige and perfection - in the manner you've earned. Name & title embroidery is complimentary on orders over $175 and otherwise is $12 per garment.Professional logos and any custom logos may be added at an additional charge and will be sewn into the garment(s) of your choice as pictured, on the right side of your garment. Q: CAN I ASK FOR A LONGER COAT? IM ABNORMALLY TALL. SO THE CHEST WOULD BE 40 BUT IF I COULD GET A LONGER COAT THAT WOULD BE IDEAL. Yes, of course we can lengthen your coat. All Medelita lab coats come with 1 inch of additional fabric in bedded in our coats that can be used for lengthening. When placing your order you would need to enter your alteration request in the comments box before submitting your order. Please note their is an additional small fee for alterations that would be added. If you have any questions or need help placing a custom order, our Customer Experience Team is ready to help, 877-987-7979. Q: Do you send out a lab coats to check size prior to embroidery? Can I send it back without shipping costs to get embroidered? Thank you for reaching out to us! Yes, we actually provide a great try on program. As long as your coats are purchased without embroidery they are always eligible for exchange, embroidery or refund. We at Medelita cover all domestic shipping expenses to and from you in hopes that you take advantage and try these coats on before finalizing your order. If you have any questions or need help placing your order, our Customer Experience department is only a phone call away, 877-987-7979. We look forward to shipping out your first try on coats.